Insider Monkey has processed numerous 13F filings of hedge funds and famous investors to create an extensive database of hedge fund holdings. The 13F filings show the hedge funds and investors’ positions as of the end of the third quarter. You can find write-ups about an individual hedge fund’s trades on numerous financial news websites. However, in this article we will take a look at their collective moves and analyze what the smart money thinks of Axon Enterprise, Inc. (NASDAQ:AAXN) based on that data. After a big jump in hedge fund ownership of Axon Enterprise, Inc. (NASDAQ:AAXN) during Q2, there was a similarly steep fall in Q3. Gains of 60% in Q2 appear to have convinced numerous hedge funds to take their profits and move their money elsewhere, as a net total of 12 hedge funds sold off the stock during the quarter. Anthony Bozza‘s Lakewood Capital Management is not a big fan of AAXN, pitching it as a short idea in the fund’s Q2 investor letter. Bozza believes that Axon’s weapons segment has nowhere to go but down, with the stock to follow in its wake. “Axon has historically been well known for its weapons segment, which produces Taser stun guns and still represents close to 70% of sales. While the weapons business is effectively a monopoly, it has reached near full penetration after 20 years on the market (94% of U.S. police forces have the product), and sales are now mostly driven by replacement demand. This business had record volume last year with 147,000 professional units sold, which we believe is significantly above sustainable, normalized levels. The company’s domestic installed base is 450,000 weapons, and assuming a seven year replacement cycle (typically weapons are replaced every five to ten years), annual normalized replacement demand would be 65,000 units. We believe that Axon has been able to achieve sales well above normal levels by implementing a new interest-free financing plan along with bundling these devices with body cameras. While customers can now pay for their weapons in 60 equal installments, Axon is able to recognize the entire revenue upon delivery. So, a customer that planned to refresh 100 weapons per year for five years can now refresh all 500 in the first year with the same out of pocket expense. We believe this has allowed Axon to significantly pull forward sales with financed sales going from zero to 40% over the past two years. Assuming some international sales and further penetration in the U.S., normalized sales are likely closer to 90,000 units, and we believe pulled-forward sales could result in actual sales below these levels for a period of time. At the current 30% operating margin, we estimate normalized earnings are $0.70 per share, and at a 20x multiple, we value this business at $14 per share,” the fund stated in its investor letter. In the eyes of most traders, hedge funds are perceived as worthless, old investment tools of the past. While there are greater than 8,000 funds with their doors open at the moment, our experts hone in on the masters of this group, approximately 700 funds. Most estimates calculate that this group of people shepherd most of the smart money’s total asset base, and by watching their unrivaled investments, Insider Monkey has formulated a few investment strategies that have historically beaten the market. Insider Monkey’s flagship hedge fund strategy beat the S&P 500 index by 6 percentage points per year since its inception in May 2014 through early November 2018. We were able to generate large returns even by identifying short candidates. Our portfolio of short stocks lost 26.1% since February 2017 even though the market was up nearly 19% during the same period. We just shared a list of 11 short targets in our latest quarterly update. What does the smart money think about Axon Enterprise, Inc. (NASDAQ:AAXN)? At Q3’s end, a total of 16 of the hedge funds tracked by Insider Monkey held long positions in this stock, a 43% decline from one quarter earlier. 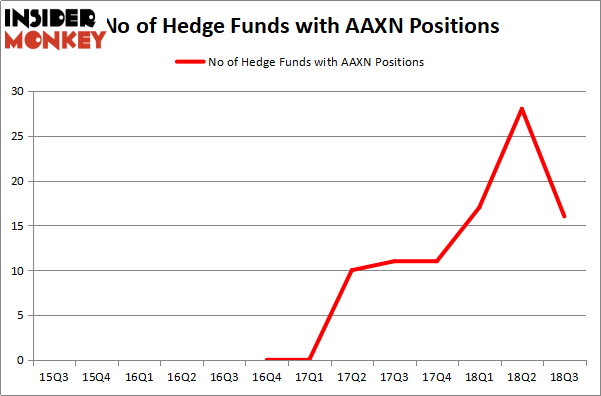 The graph below displays the number of hedge funds with bullish positions in AAXN over the last 13 quarters. 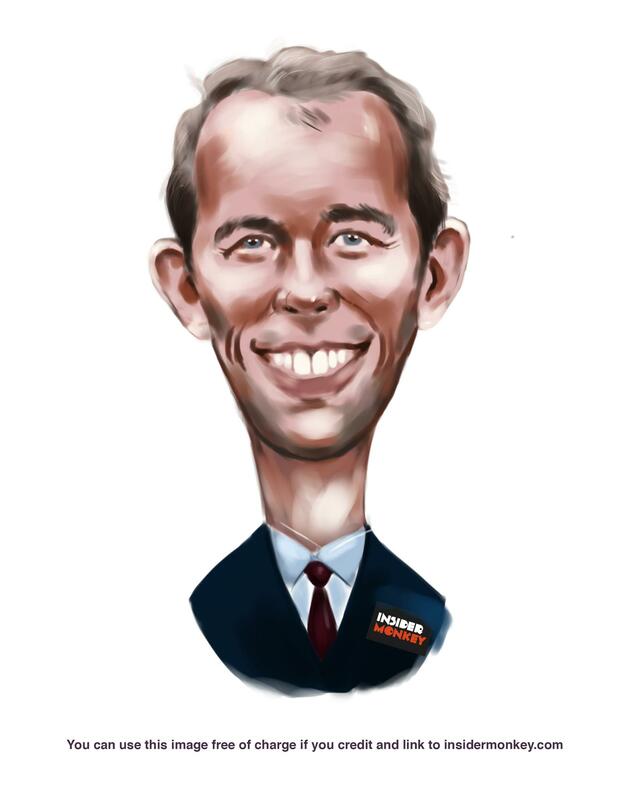 With the smart money’s positions undergoing their usual ebb and flow, there exists a few key hedge fund managers who were upping their holdings meaningfully (or already accumulated large positions). The largest stake in Axon Enterprise, Inc. (NASDAQ:AAXN) was held by Abdiel Capital Advisors, which reported holding $293.7 million worth of stock as of the end of September. It was followed by Broadwood Capital with a $52 million position. Other investors bullish on the company included Polar Capital, Sandler Capital Management, and Renaissance Technologies. Because Axon Enterprise, Inc. (NASDAQ:AAXN) has experienced bearish sentiment from the aggregate hedge fund industry, it’s easy to see that there exists a select few hedge funds who were dropping their positions entirely heading into Q3. Intriguingly, Philippe Laffont’s Coatue Management dumped the biggest investment of all the hedgies followed by Insider Monkey, totaling an estimated $78.4 million in stock. Israel Englander’s fund, Millennium Management, also dropped its stock, about $11.6 million worth. These transactions are interesting, as aggregate hedge fund interest fell by 12 funds heading into Q3. Let’s also examine hedge fund activity in other stocks – not necessarily in the same industry as Axon Enterprise, Inc. (NASDAQ:AAXN) but similarly valued. These stocks are Kirkland Lake Gold Ltd. (NYSE:KL), Spectrum Brands Holdings, Inc. (NYSE:SPB), TCF Financial Corporation (NYSE:TCF), and Amedisys Inc (NASDAQ:AMED). All of these stocks’ market caps match AAXN’s market cap. As you can see these stocks had an average of 23 hedge funds with bullish positions and the average amount invested in these stocks was $384 million. That figure was $440 million in AAXN’s case. Spectrum Brands Holdings, Inc. (NYSE:SPB) is the most popular stock in this table. On the other hand Kirkland Lake Gold Ltd. (NYSE:KL) is the least popular one with only 20 bullish hedge fund positions. Compared to these stocks Axon Enterprise, Inc. (NASDAQ:AAXN) is even less popular than KL. Considering that hedge funds aren’t fond of this stock in relation to other companies analyzed in this article, it may be a good idea to study why the smart money isn’t behind this stock.